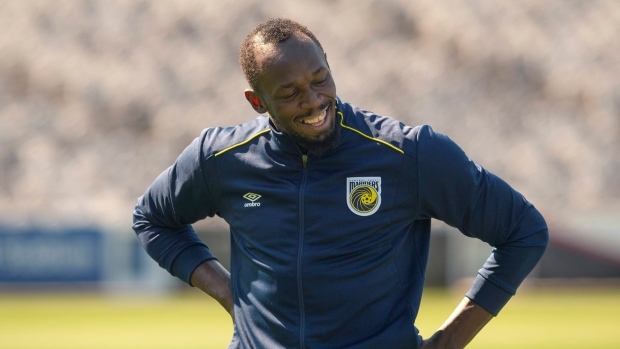 GOSFORD, Australia -- Usain Bolt's attempt to win a contract to play as a professional in Australian football's A-League began in earnest on his 32nd birthday Tuesday when he trained for the first time with the Central Coast Mariners. The eight-time Olympic sprint champion began an "indefinite" training period with the Mariners with a 15-minute passing drill under the eyes of head coach Mike Mulvey. A crowd of around 50 reporters and photographed crowded around the players tunnel at the Mariners' Central Coast Stadium to catch a glimpse of Bolt who smiled and offered a thumb's up. "I'm entirely out of my comfort zone but that's why I am here," Bolt said after training. "It's just like track and field. The first day of training is always the roughest one. Bolt has a long-held ambition to play professional football but his previous trials in Germany, South Africa and Norway have been unsuccessful. Mulvey has said the Jamaican sprint star will be treated as any other player and will not receive an A-League contract unless he meets the required standard. "For us it's really about getting him out there, see what he can do and let his performance do the talking," Mielekamp said.